I have had my business of Decorative Artwork since 1992. Over the course of those years I have worked with many painters from different areas. The majority of the time things went well for the client. And for myself as well. But, I have run across some disasters too. Here are some tips for hiring the right painter for your project. I had a client a few years back that needed their 2 story family room painted. It needed some patching and in some areas on the ceiling there needed to be drywall tape replaced. My client got the name of a painter from someone she didn’t know but she told me the guy was excited about the job and didn’t mind working on scaffolding. I finished my decorative painting before the painter and his buddy were done. But I had to go back the next day to be paid. When I went back my client was almost in tears. The painters had “finished” and they had been paid. Well, she brings me in to show me what they had done to her family room ceiling. They had used blue painters tape instead of drywall tape to fix the areas that needed it! And the tape was starting to peel off. She had called the painter to discuss it with him only to find out he had left town. That is the worst I have seen. Most painters are reputable and trustworthy. But….. #2…..When you do find a painter you can trust, if they say they need a deposit, give it to them. After the economic downturn I’ve known contractors that just don’t want to run a tab at the paint store anymore. Probably holds true for many trades. #3…..I think this may be as important as #1. Let them do their job. Don’t be underfoot and try to keep children busy with other things. #4…..Pay promptly. Times are different now. Rick Wehrman….I have known him for maybe 20 years. I not only recommend him because he is a great painter, ( his son right along with him, and sometimes his daughter as well), but they are great with customers. They go in and do their job and do it well. For me, it is important to have a good rapport with the painter on the job. It makes my life a lot easier. I finished up a portion of a large project with Rick and crew. Here is an example of how he makes my life easier. 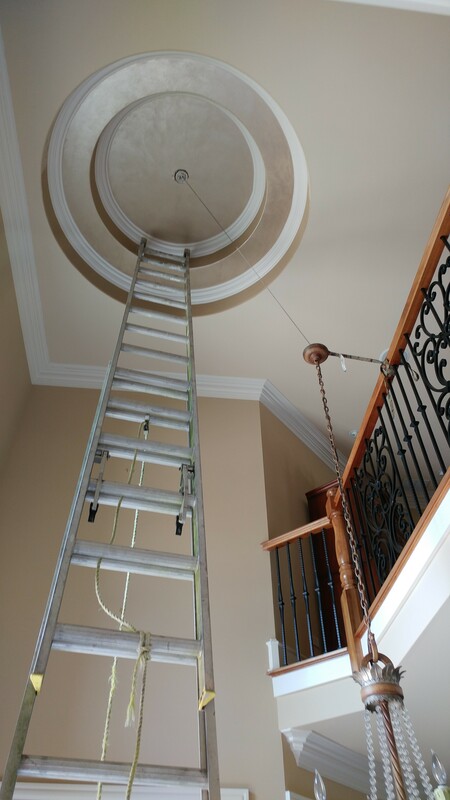 The client wanted their foyer tray ceiling done. If I did it it would mean bringing in scaffolding, hiring someone to put it up and then take it down again. Rick has done bits of faux finishing for me before so I asked him if he would take it on and he said he would. The faux that was to be done in the tray in the foyer was the same one that I had done in the dining room tray ceiling. 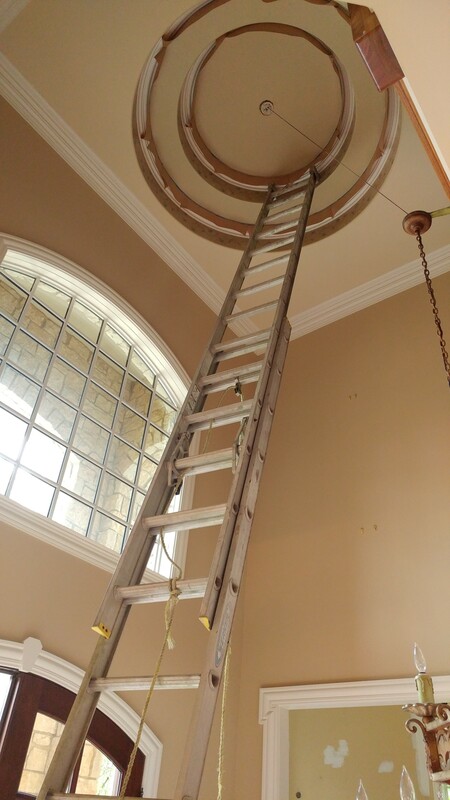 Besides having good work done, the foyer tray ceiling was less costly because Rick uses an extension ladder to do them. Saves a great deal of time as well. 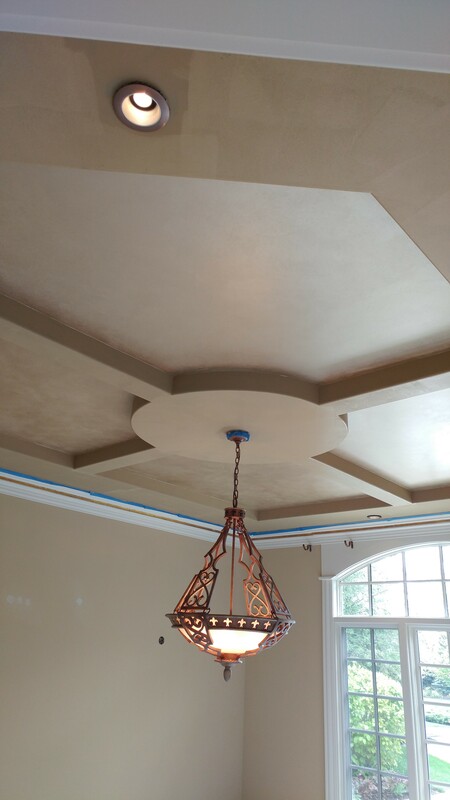 The photos in this post show the tray ceiling in progress and then finished. Doesn’t it look great?! I hope you consider this the next time you are looking for a painter. It could save you heartache and money. 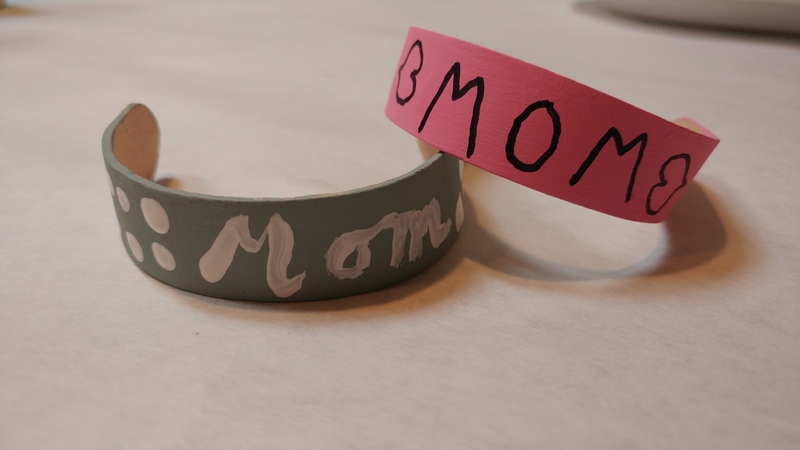 I saw this somewhere and I think it would be such a great craft for kids to give their mom for Mother’s Day. I think I originally saw it on Pinterest but have seen it twice more since then. The supplies you need are few. The sticks you can get at Walmart or a craft store. 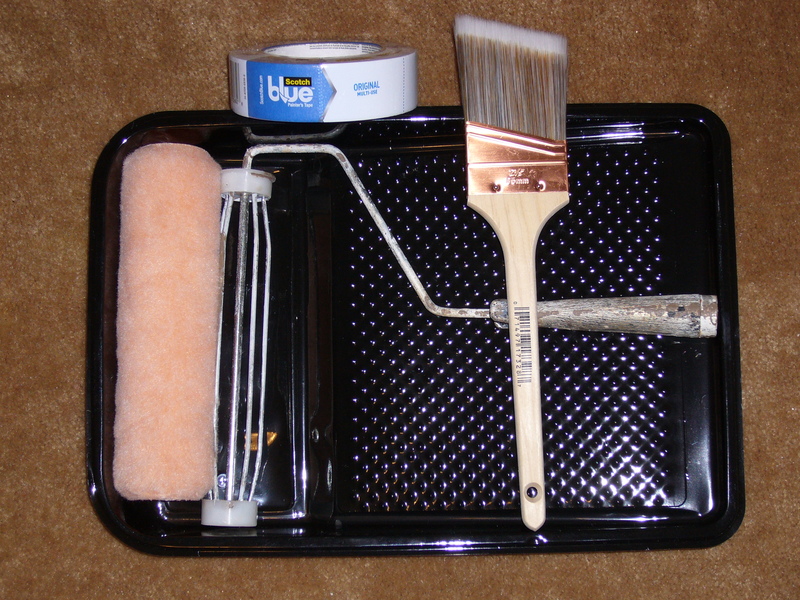 Also the paint brushes. For the paint I used one color that is actually a wall color, but very fashionable. Or, as shown, the craft paints. 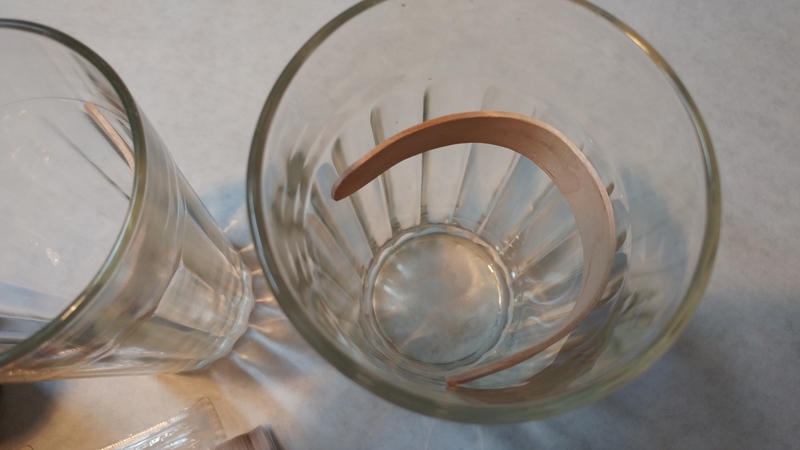 You will also need a couple of drinking glasses or cups. While you are preparing your work space bring a pan of water to a boil. The pan should be big enough for the sticks to lay in with a little room to spare. 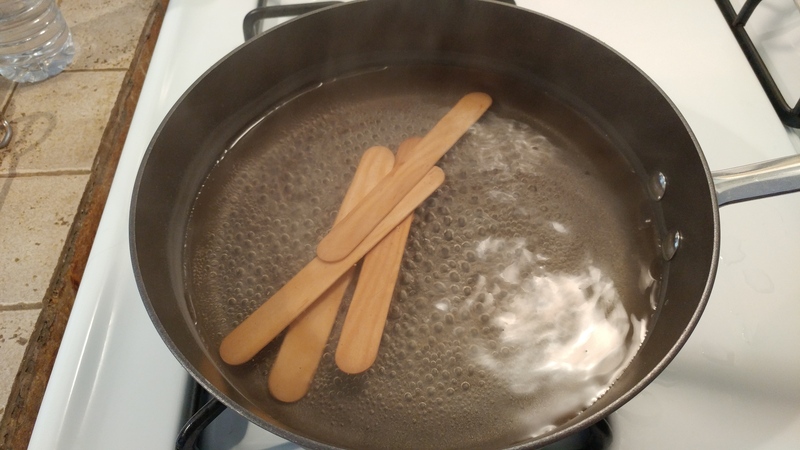 Once the water is boiling put your sticks in it and boil for 15 minutes. Put in a few extra sticks in case some break, although I did’t have a problem. After 15 minutes take them out one at a time, immediately starting to bend them easily into a “C” shape. Fit them in to the sides of a glass. They cool quickly, so once you take one out of the pan using tongs, you’ll be able to start shaping it right away. The sticks need to dry overnight. Once dry, they can be painted and personalized. Update: the chair is coming along nicely. I have the fabric and this week will be finding the right trim. I heard about a huge fabric and trim warehouse in Chicago that will hopefully have what I need because I haven’t found the right one out here. Field Trip! I may even take pictures and post on it if it’s as good as I was told. Just a quick stop by to let you see the progress on the chairs. Doesn’t look like anything special? The unique part comes a little later. Next step is starting shortly. 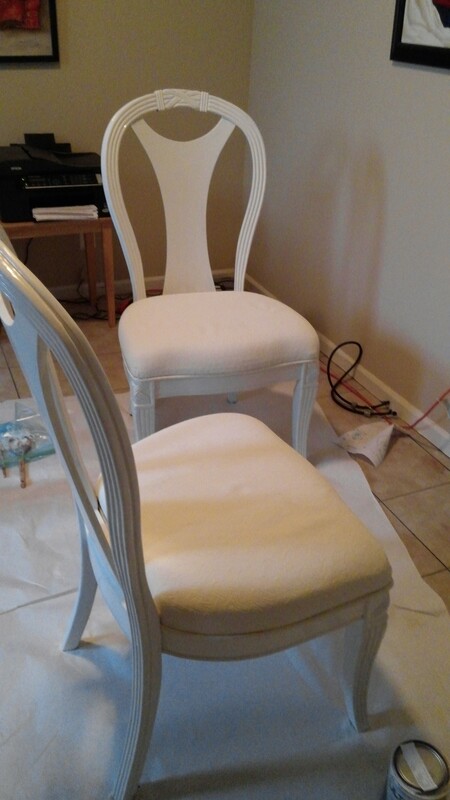 The directions called for doing the whole chair with Annie Sloan Chalk Paint, a very well known specialty paint. I decided, however to just use it only on the fabric seats and use a product that I know well for the wooden parts of the chairs. That would be Pittsburgh Interior Eggshell Finish Ulta. It is available at Menards. It took almost the whole quart to put 2 coats of the chalk paint on the seats and not quite a whole quart to put 3 coats on the wooden areas. I’m really liking the way they are coming out so far! You may have seen these around, but did you know how easy they are to create? Simple. First of all you need to get yourself to Goodwill. 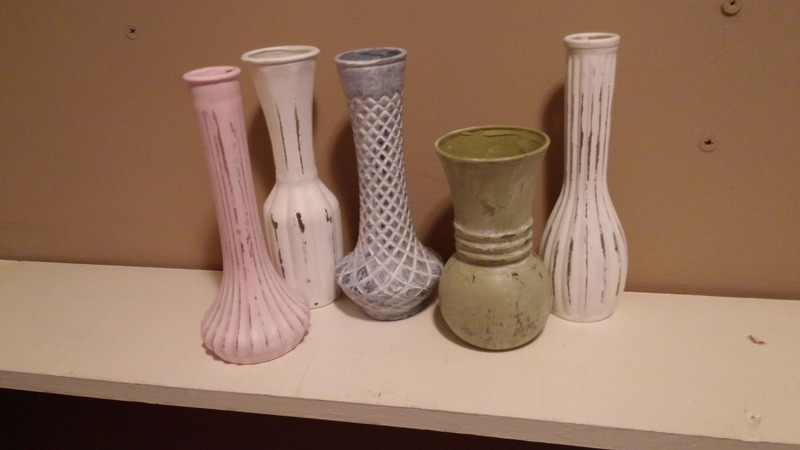 They usually have a good supply and several styles of bud vases and cheap too. At your favorite art and craft store you can pick out the colors of paint that you want to use. I used white, pastel pink, blue and green. It doesn’t have to be the kind of paint you use on glass, actually it may be better if it isn’t. I used standard craft paint for mine. 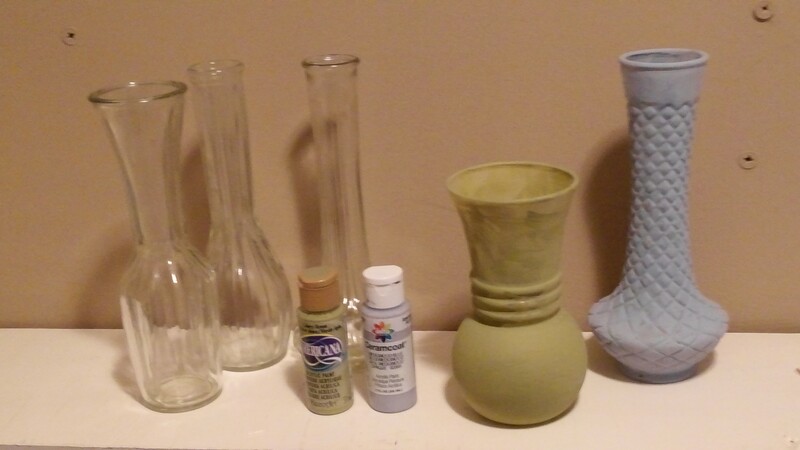 The main thing is to make sure the vases are clean before you paint them. If they really need it rub them with alchohol to remove any residual dirt. I put 2 coats of paint on mine using a small craft brush (a foam brush would work as well). Once they have dried thoroughly, usually overnight, they are ready for the next step which is sanding. 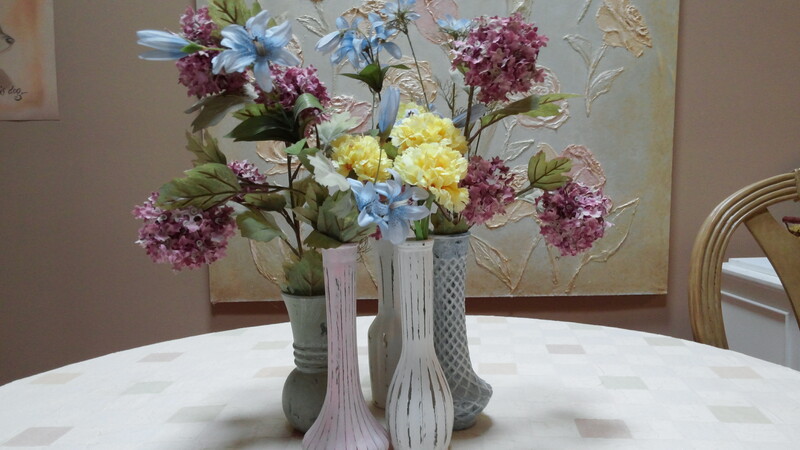 You can use them as individual bud vases or you can do as I have done by putting them in a grouping with an assortment of flowers. They would make a nice addition to an Easter arrangement too! It’s going to be a good day ladies and gentlemen! We’re on to the second phase of Painting Kitchen Cabinets. 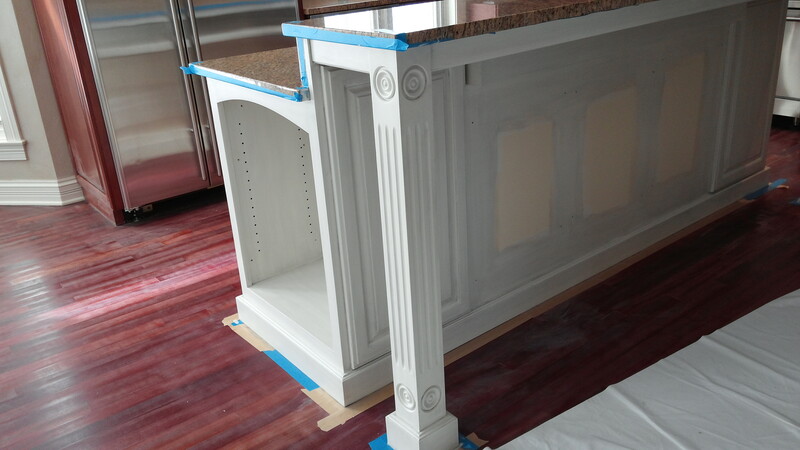 At this point the kitchen island has been sanded and has a coat of primer on it. Now we are ready for paint. I applied 2 coats of a cool white (it happens to be their trim color) with a 4″ roller and a brush, drying thoroughly between coats. 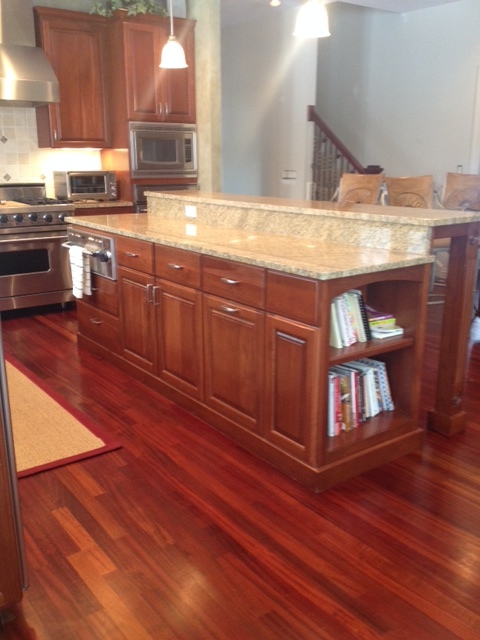 The paint I choose to use on cabinets and furniture is an interior eggshell finish. I have tried the paint that some companies specify for furniture and have never been happy with the results. I do, on occasion, use milk paint which has come back into popularity. Let the second coat of paint dry overnight, insuring a smooth application of glaze. The glaze I choose to use for furniture is Faux Effects AquaCreme. It stays workable longer than other glazes on the market. You may want to test first and see what ratio of paint to glaze that you want to use to get the amount of color that you are looking for. 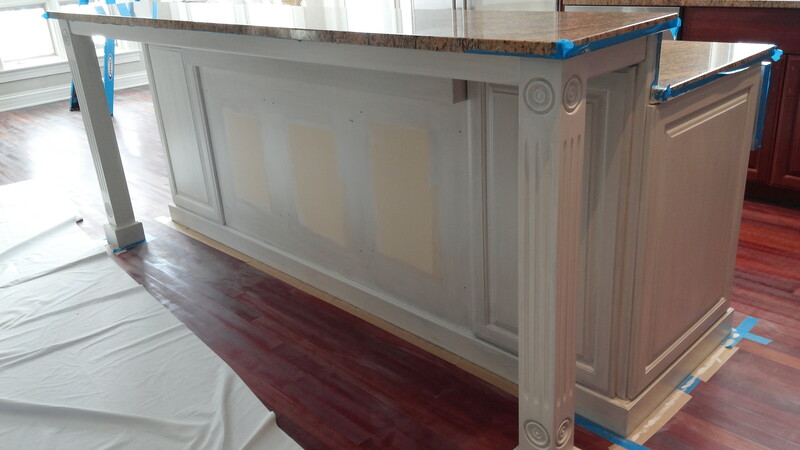 What I did when creating a sample for my client was I went to Home depot and purchased a small piece of moulding. This way they could see how the glaze will look on the hills and in the crevices. I used approximately one part paint to three parts glaze. When applying the glaze I brush it on and wipe it down with cheesecloth. Menards has the most economical cheesecloth in packages. I, however, if possible, prefer to get it on a bolt from a fine paint store nearby. It has a better feel to me and already comes cut into sections. 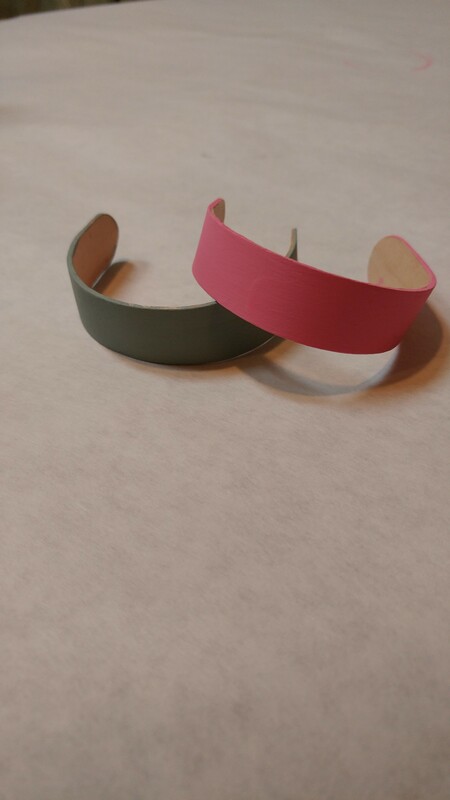 If you get the packaged kind you will want to spend a few mintues cutting into useable pieces, say 12″-18″ long. I applied the glaze in an area that got the most natural light so that my clients could get a final look and okay the glaze color before continuing. I then continued around the island covering all the newly painted areas. This needs to dry at least overnight and even better, 2-3 days before applying the finish coats. This is a closeup of how the glaze looked. Next week the final product will be posted. Go out and have a good day everyone! 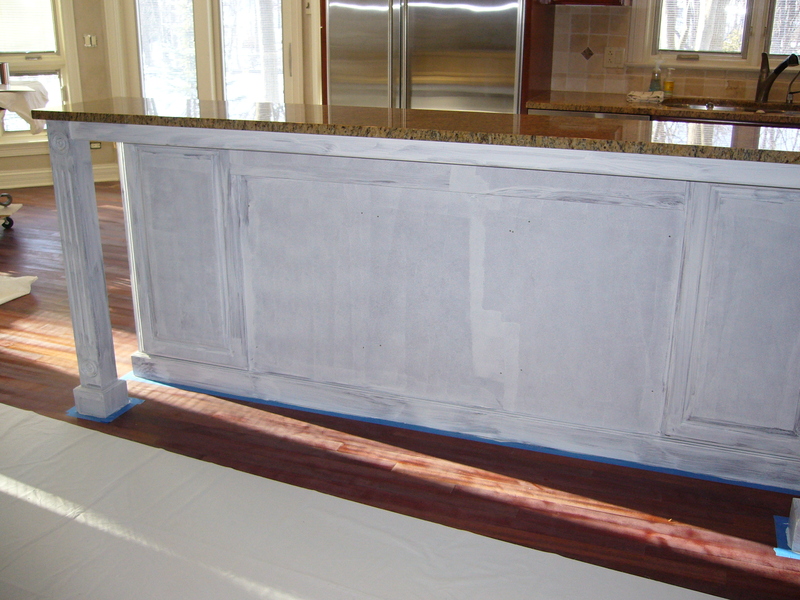 Have you considered painting your kitchen cabinets and don’t know where to start? Or maybe a furniture piece? The basics are the same for both really. The transformation is quite dramatic. They have actually been working on changing their entire kitchen including my redoing the walls from a green faux finish to one with more neutral tones. New drapery treatments are being made as well. I can’t stress enough that prep work is essential and well worth the time and effort. 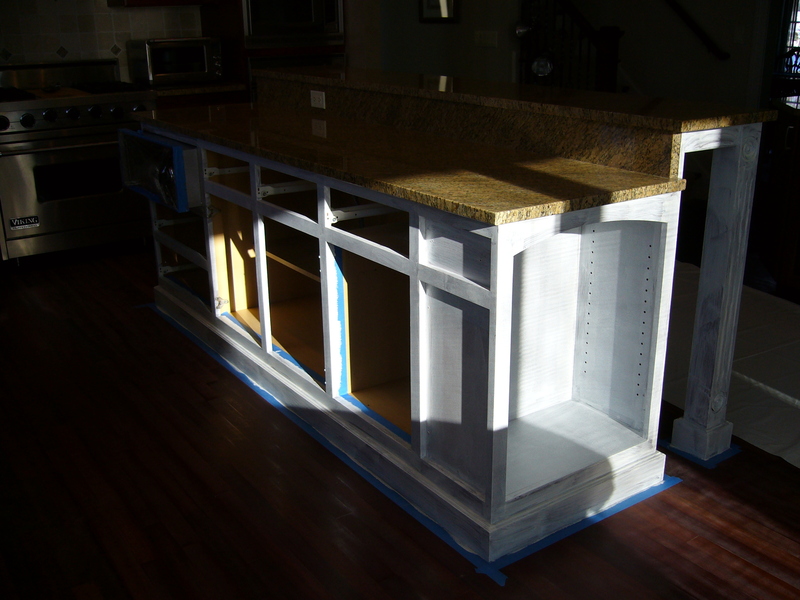 For starters, if you are going to paint cabinets make sure that they are clean and free of grease spatters. This will help the paint layers to adhere to the wood (or whatever material they are made out of). 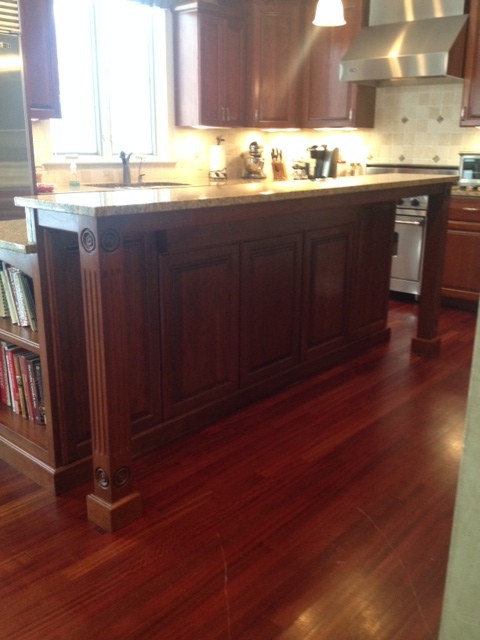 Remove the cabinet doors and drawers if you are able. (If you can’t remove them they can still be painted it’s just a little trickier.) While you are removing them, and this is important, mark or number which piece goes where. From experience I know what a difficulty it can be if they are not labeled. Once everything is set in place all of the surfaces can be sanded. Now, they don’t need to be sanded to bare wood, they just need to have a little tooth to them so that the primer and paint will adhere. All set to start? Is it safe for me to assume that you have taped off and laid out dropcloths? If you need help with that then leave a comment here and I will reply. 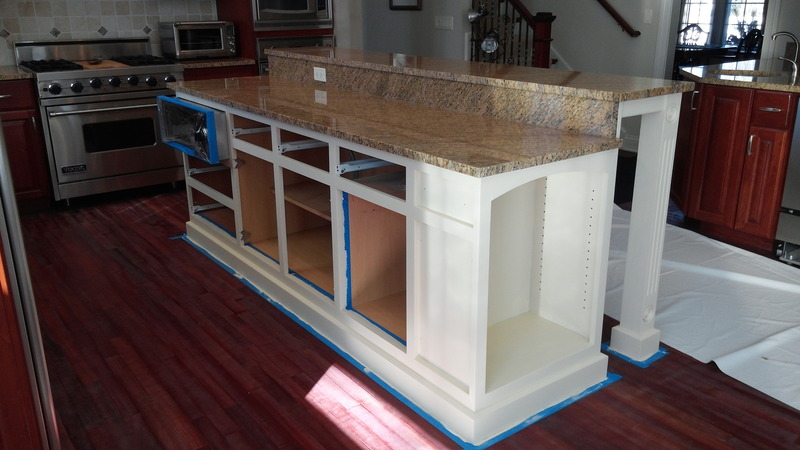 And with that you are well on your way to having a new facelift for your kitchen! 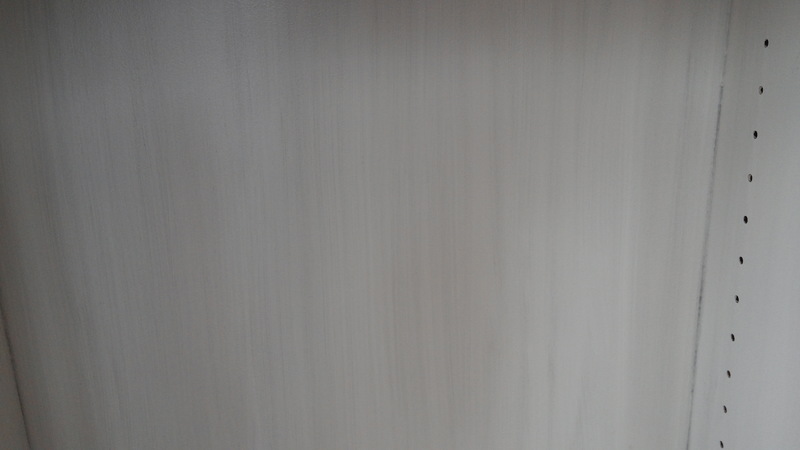 Whether you are going to do a faux finish or if you are just planning on painting your walls, you will need a good basecoat on the surface. For faux finishing the best type of paint that I have found for a base is latex in an eggshell finish. When I say eggshell I am not talking about the color eggshell, I am talking about the sheen of the paint. An eggshell finish is in between a flat and a satin. Satin can be good to use, but not necessary, and you can save your pennies to be used elsewhere. There are the matte finish paints out now, but they are too close to a flat finish. The reason that you need a bit of a sheen is so that the paint can move easily. However it doesn’t mean that the more sheen the better. 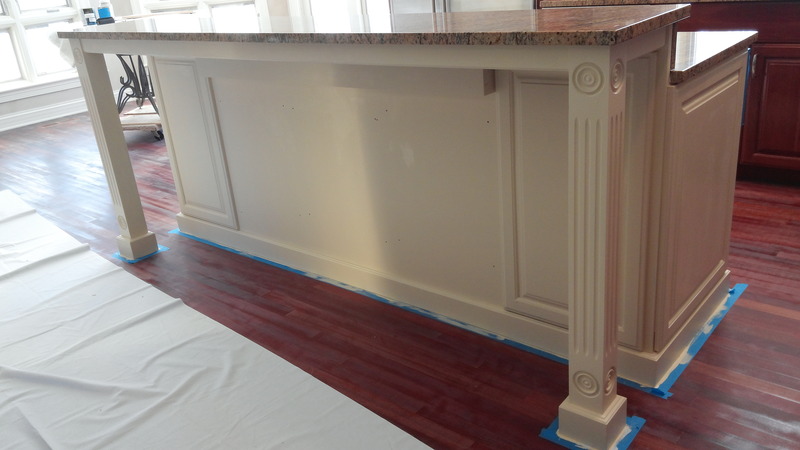 If you try using a semigloss or more you will find your faux to be a little “slippery”. Some painting tips that I have used over the years is, number one….have a good paintbrush. A fellow contractor had told me about the kind to use and I seldom use anything else. It is a 2 1/2″ angled brush. I believe it is also called a sash brush. Most brush companies make this size. I go with a nylon/polyester one for use with all paints. I am picky, though, about whoich 2 1/2′ brush I choose. I want one with a more slender handle. Maybe it’s just because I am a woman, but I find it to be more comfortable to use, especially if I have alot of painting to do. Tape is another important item. Tape sure isn’t what it once was. You go to buy a roll of tape and you may find a whole aisle of just different types of tape. Yes, the blue tape is best to use when taping off for a paint job. For me, I have found the regular blue tape to work the best. 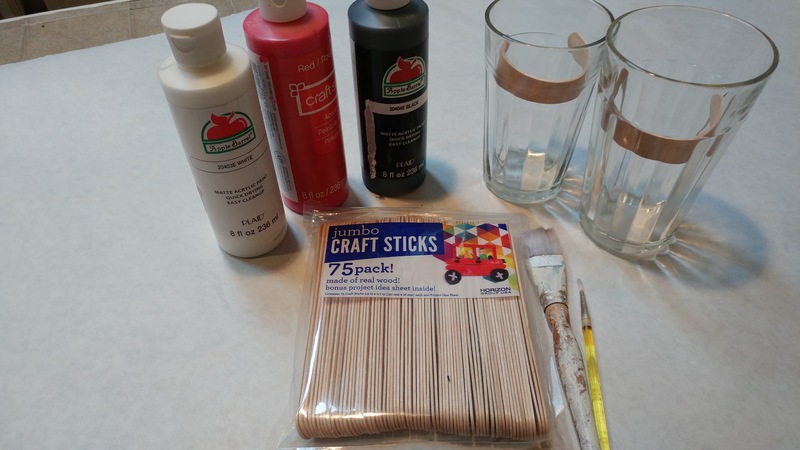 The ones that I have tried that are especially for painting just don’t stick well for me and the paint then goes under the tape and onto the moulding or cabinet or whatever. Defeats the purpose. As far as rollers and roller covers go, I tend to go for the lighter weight. The rollers themselves have lasted me a long time. I know that when it comes to the roller covers some people use specific ones. 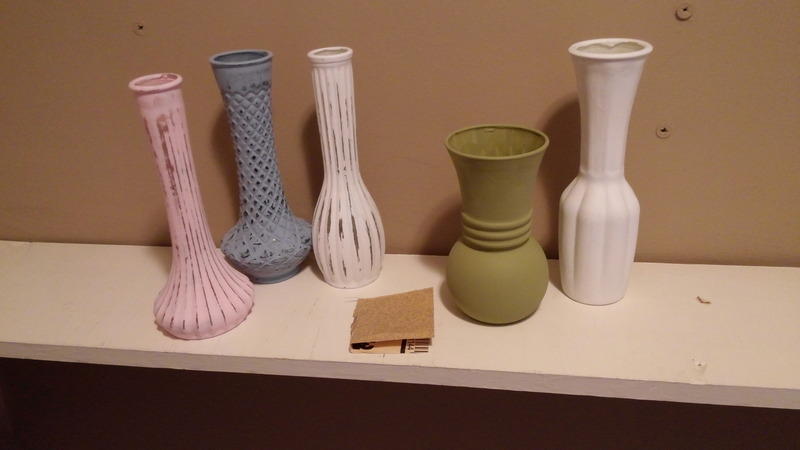 I tend to go for the less expensive and then just throw them out after I have finished a room. They are usually only good for one coat. The more expensive ones can be washed out and reused. Along with the rollers come the paint trays. I use the liners with the trays and discard them after each use. They will keep your trays in good shape and longer lasting. I have found that repeated washing of the trays causes them to rust. Dropcloths are another important material item as well. Here again there is such a variety. I find the cloth ones to be way too heavy and then you have to go to a laundromat to wash them in their larger washing machines. The plastic ones are a pain if you ask me. To me they are only good for covering furniture. The dropcloths I have found to work the best for me are the paper ones that have a nonabsorbent backing. They can last a long time when treated right. They are relatively lightweight too. If you were to ask 5 different painters/decorative painters you would probably get several different answers and solutions. To be honest I would like to suggest that if you are hiring a professional let them do their job. They most likely have found what works best for them. And this is what they do, they are going to me more knowledgeable on the subject. So does this officially fit under the Faux Finishing category? Yes, indeed. If you aren’t doing the basecoating yourself you have to make sure that whoever does do it used the right kind of paint. And learning about the materials involved may lead you to have a new respect for the people in the trade. Good luck to you if you have a project in the works or are thinking of one in the future!